At the close of 2012, Congress and the Administration faced critical fiscal issues: whether to renew the Bush-era tax cuts; sequestration (spending cuts of up to 8 percent in nearly all social and defense programs); and whether to raise the debt limit. In a deal approved on New Year’s Day, Congress resolved some of these issues, but mostly kicked the can down the road a few months. On the surface, this deal looks good for low-income Americans, as there were very few spending cuts to social or entitlement programs like Medicaid, SSI, and SNAP. However, the deal does nothing to prevent future cuts to these programs. In fact, it has made those cuts more likely down the road. Had spending cuts and tax increases been wrapped into one large package, President Obama could have leveraged the scheduled December 31 expiration of all the Bush tax cuts to generate more revenue, offsetting the need for as many spending cuts. But now that most of the tax cuts have been made permanent, there is no incentive for Republicans to agree to additional revenues – thus increasing the chances that additional deficit reduction will come only from spending cuts. But with the tax issue settled, there are now three looming fights around spending. In mid-February, the federal government will reach the debt ceiling—the point at which no additional money can be borrowed without Congressional authorization. If Congress does not act, the U.S. will default on its debt, with disastrous repercussions for the economy. Republicans have said that, in return for raising the debt ceiling, they will demand steep spending cuts. No one has specified which cuts they want made, but social program spending appears most at risk. This includes Medicaid funding to help poor Americans access health care, SSI disability benefits, SNAP food benefits, and programs administered through the U.S. Department of Housing and Urban Development. When the debt limit is resolved, the debate on sequestration will be renewed. If a new agreement is not reached before March 1, automatic cuts to federal spending will kick in—$1 trillion over ten years. Half the cuts will be to defense spending, and half to other domestic spending. If sequestration occurs, agencies like HUD could find their budgets slashed by as much as 8 percent. Moreover, under the terms of the deal, every agency program must be cut by the same amount, giving HUD no latitude to protect anti-poverty programs. Neither political party favors sequestration. Both sides want to prevent major defense cuts, and Democrats are concerned about domestic spending reductions. For that reason, most believe that Congress will find a way to avoid it. But unless the Administration and Congressional Democrats can strike a deal with Republicans on further revenue increases, Congress will not be able to avoid painful cuts for poor Americans without kicking the can down the road again. Lastly, the “continuing resolution” that is currently funding the federal government—due to Congress’ failure to pass a budget in years—is set to expire after March 27. Unless a budget is passed, the federal government will shut down. 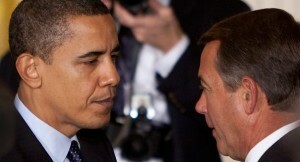 In return for passing a bill to fund the government through September, Republicans may demand spending cuts. The Law Center and other advocates are urging Congress and the Administration to reject any proposal that puts the burden on low-income Americans. We hope you’ll join us in sending letters like the one put out through the Campaign for Housing and Community Development Funding. This entry was posted in Housing and tagged debt limit, domestic spending, fiscal cliff, safety-net, sequestration, spending cuts. Bookmark the permalink.